It was a long long lasting and difficult process until the landing site of the Huygens probe could finally be pinpointed within the context of the Cassini images. Because of the lack of corresponding structures, it had even been speculated that the landscape may look totally different for Cassinis ISS camera, working in a narrow spectral range centered at 938 nm, and Huygens DISR camera working in a broadband but overlapping spectral range. But now, after the results from radio science showed that Huygens landed much more (about 80 km) to the north-west than was prior published, it was possible to find corresponding structures in the results from the radar swath of the T8 Flyby of October 28, as well as in the Cassini ISS optical images, that enabled an exact pinpointing of the landing site. Mosaic of the surface of Titan stitched from Cassini ISS images. The red circle marks the region that was supposed to be the landing site of Huygens for a long time, while the red cross marks the correct position of the landing site. The green box corresponds to the green frame in Figure 2. 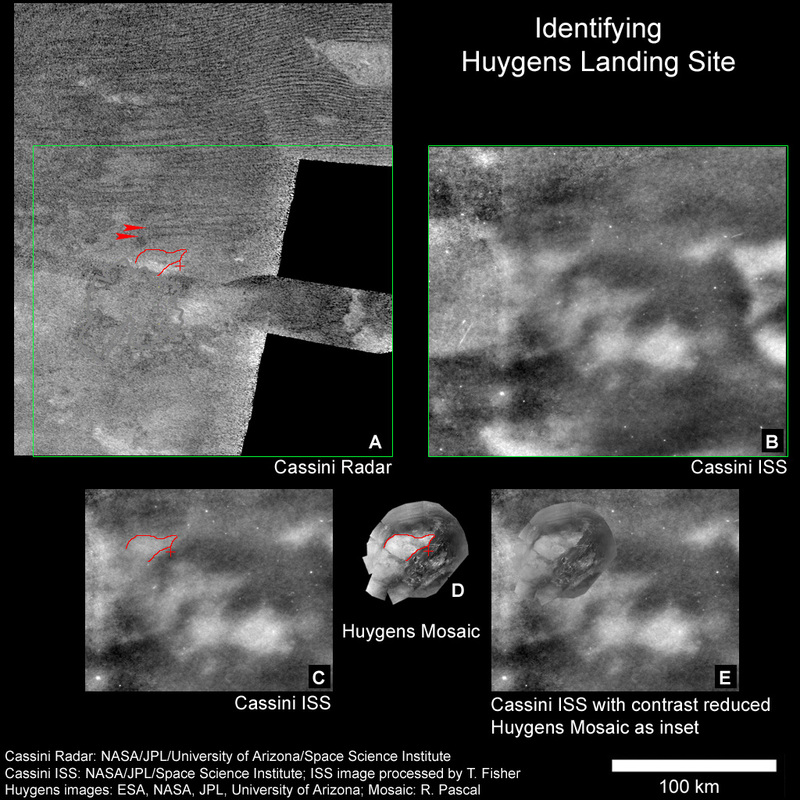 Huygens Mosaic; the red cross marks the landing site of Huygens, the two red arrows mark two "Cat Scratches" that are also visible in the Cassini radar image Fig.3A. Figure 1 is an overview about the region where Huygens made its descend to the surface of Titan. While the region highlighted with a red circle was thought to be the landing region, it now turned out to be located about 80 km to the north-west (red cross). Cassini radar (Fig. 3A) shows a lot of dunes in the north, also called "Cat Scratches" by the Cassini team due to their look in the very first images that showed these kind of structures. Near the Huygens landing site there are two of these lines running in west-east direction. They clearly correspond to two dark lines visible in the north of the Huygens mosaic, Fig. 3, as well as in the Panorama "Huygens Distant View". Cassini ISS images (Fig. 3B) in a revision by T. Fisher without the disturbing seams clearly show this overall triangular shape of the highland region as is visible in the Huygens mosaic, and some more details around. Figure 3: Corresponding details in Cassini ISS and Cassini radar with the Huygens Mosaic. A: region around the Huygens landing site as seen by Cassini radar. 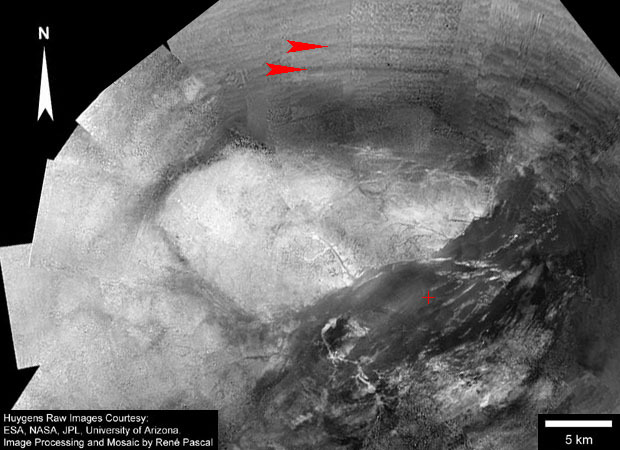 The red line highlights the shape of the Highland region in the Huygens mosaic D. The only corresponding details that really catch the eye are the two "Cat Scratches" north of the landing site. The green frame highlights the position where the Cassini ISS optical image B is located. B: Cassini ISS image, taken at a wavelength of 938nm. Image created by T.Fisher by registering and stacking several Cassini ISS raw images. C: The same Cassini ISS image, again the red line highlights the shape of the Highland region in the Huygens mosaic D.
D: Huygens mosaic with the roughly triangular shape of the highland region highlighted in red. Its overall shape as well as some surrounding details are visible in the Cassini ISS images B and C.
E: The Cassini ISS image again, with a contrast reduced version of the Huygens mosaic in the correct place. Please note: the idea of a calibration error, as proposed in the February 18 and March 20 articles, turned out to be not correct!